July Book of the Month! 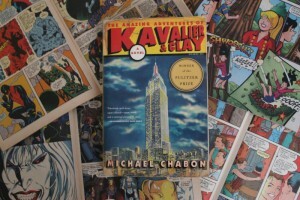 This month we’re reading Michael Chabon’s Pulitzer Prize-winning American epic, “The Amazing Adventures of Kavalier & Clay”. Released in 2000, “The Amazing Adventures …” is a coming of age story of two ambitious boy geniuses who find each other – and the fantasy world of comic books – growing up in New York during the Second World War. Buy a discounted copy of this title all month long at the Book Exchange, and don’t forget to log on to their Facebook page for more information and a discussion with other club members!